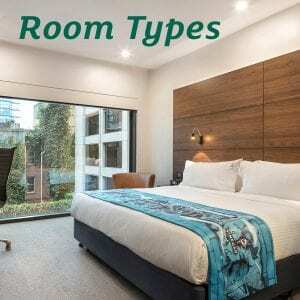 If you are staying in Melbourne on business or leisure, the King Executive and 2 Bed Executive rooms at Holiday Inn Melbourne on Flinders offer a spacious 28 square metres, with light wood grain and relaxed tones to ensure guests feel at home. Rest easy in your pillow top performance bed and your choice of soft or firm pillows. Block out the Melbourne city lights partially or fully with our electric black out blinds, conveniently controlled from the convenience of your bed. Enjoy the latest technology with our MediaHUB with HDMI and USB charging ports which directly connect to your 55″ full HD TV, providing you with the ability to stream movies or complete work from the day. On the bedside you can charge your iPhone or Android phone with our Bluetooth alarm clock. All of our rooms have complimentary WiFi, so you can be confident in your ability to stay connected to the outside world. Holiday Inn Melbourne on Flinders is a great choice for those looking to stay in the Melbourne CBD for work or leisure. Located on the highest floor, with a little extra. Each room has a pillowtop bed, even bigger smart TV, free WiFi, floor to ceiling windows, blackout blinds, dual rain shower, large desk, Nespresso machine, upgraded amenities, leather lounge chairs and coffee table with impressive cityscape views. Perfect for executive travel. Start your day with an impressive shower and Nespresso Coffee. Get to work at the large desk with free WiFi. Relax on the 2 double pillowtop beds and watch a bigger smart TV. Floor to ceiling windows flood the room with natural light with blackout blinds for sleep-ins.